I found it “funny” however, when the hero (Kade, a “Breed” male) adamantly pursued the heroine (Alex – a human female, with a “twist”) from the start. Yet once he discovered her “Breedmate” twist, his internal musings were all about keeping her at a distance 🙄 (despite the fact, that due to the Breedmate mark, she’s now officially perfect for him). The last thing he needed right now was an emotional entanglement, least of all with a female bearing the teardrop-and-crescent-moon mark. It’s good. Real good. In fact, the sexual connection between the two main characters quickly becomes much more than that, and the depth of their emotions for each other is actually very believable. This author never fails to make me sigh like crazy when her characters become involved. I don’t roll my eyes. I don’t cringe at the “corny”. I don’t even think it’s too overdone (even though the “I love you’s” do come pretty quick). I dunno…she’s just good at making that “relationship rush” intense, all the while, keeping it real. So things get heated in Alaska, when Kade (who has just recently joined the “Order” in Boston) is sent back home (to Fairbanks Alaska) to investigate a slew of possible vampire related murders occurring there. Kade held Lucan’s stare, knowing he could hardly refuse the assignment, even if Alaska was the last place he wanted to be. When he’d left there last year to join the Order, he’d done so with the hope that he might never return. He wanted to forget the place where he’d been born. Since “The Breed” (vampires) are still unknown to the human world, he must try and figure out what’s going on, while keeping the humans in the dark. If it were to leak to the human populations that not only dud vampires walk among them, but one megalomaniac intended to put himself in power and enslave them all? So here’s the “overall” problem. Enemies of the “Order” are still at large, and humans are in danger. An ancient and potentially dangerous original “Breed” male *may* have escaped the clutches of his captor. His captor being his evil Breed grandson (or something like that) with illusions of grandeur. Before his escape, however, his grandson had succeeded in brutally mating (and killing) numerous kidnapped human female “Breedmates” to this Ancient and now has an army of ruthless, Generation One Breed males on his side. His goal? To direct his new army in destroying the Order so that he can finally take over humanity. And while he’s at it, he’ll continue to make minions (human slaves), and kidnap “Breedmate” females to further the “Breed” line, his way. Okay, so we’ve got the enemies covered. Well, Not quite. While the Order is trying to locate the Ancient, and disband that group, they also have to contend with various “turned” breed males who are now just…killer vampires. They have lost their souls to bloodlust, and also kill, indiscriminately. Ok so we’re done. Nope, still not quite. Cause amongst these paranormal enemies, there are always a few pesky “bad” but regular humans that can get in the way, too. Now, back to the love. Cause it’s the best part. Kade shows up in Alaska, has a touchy past with his elite family, and worries about his twin brother who has gone missing. While investigating, he meets Alexandra (a bush pilot who discovered one of the slaughtered families). She too, has a touchy past, having encountered something strange as a child (fangs). Something that murdered her family (fangs). Something that she dare never speak of again, yet something she continues to fear to this day (fangs). Is it back for her? It’s lust at first sight for the both of them. His silver eyes bored into hers like spears of ice, only the feeling she got the longer she held his gaze was not one of cold but of bone-melting heat. And there was no mockery in his expression. He listened with an intensity that shook her to her core. While they help each other with the case, the close proximity allows them to connect emotionally. Through this closeness, they help each other through the turmoils that they have kept secret from everyone else. But it’s not that easy (it never is…). Because you wanna know what? If Kade let’s her in on his main personal secret (you know…the fangs and the creepy eyes that keep popping up at the same time as other things do…), well..let’s just say that what he is, is putting a cramp in his style. He drew back, his head low, face turned away from her to hide the changes he could not let her see. Changes that would startle her. Changes that he would not be able to explain. And considering the fangs are the very things that Alexandra remembers from her terrifying childhood, she’s bound to run for her life if she ever catches a glimpse of the real him. So all that good fun —> (how does he tell her? how does he resist her? how does he honor her? how does he keep her safe? how does he just…keep her?) —-> coupled with the numerous dangerous enemies that abound. Oh!! and of course, tidbits from his “brothers-in-arms” from the Order that come into play. 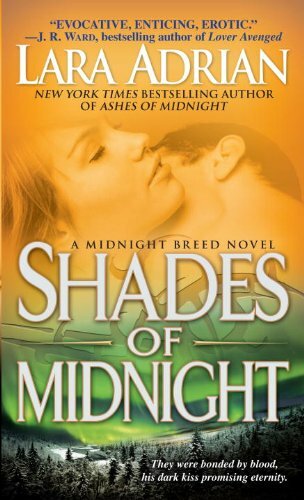 There’s a great little side story that starts in this book, that I’m SUPER excited about, since it’s the main story in the next book: Taken by Midnight: A Midnight Breed Novel. Yup. All in all, a great well-rounded and satisfying read. I pretty much read it straight through, and while at times, I “skimmed” just a bit, it was just so I could get to the juicy parts faster. So click here and tell me…who’s your favorite Breed male? I think mine remains Lucan…no…Tegan…mmmm…ok both 😉 I’m now off to read the next one! I have to pick up this series.Like I said I read the first one…. just not the rest. I got to shape up. The first one had me hooked. It’s still my favorite but the others are really good too. But that intensity in the first one..all that turmoil and angst! YUP – good stuff! Tegan is my favorite Breed, hands down!! !